American preacher; born at Liptó-Szent-Miklós, Hungary, Sept. 18, 1830; died in New York city Oct. 10, 1884. Hübsch was descended from the Jaffe family. At the age of ten he was sent to Budapest, where he attended the evangelical gymnasium, studying Hebrew at the same time. In 1845, before he had graduated, he accepted a position at the Jewish school of Alt-Ofen. He was concerned in the Hungarian Revolution of 1848, in which he fought as a "Honvéd" officer; at the defeat at Világos he barely escaped with his life. 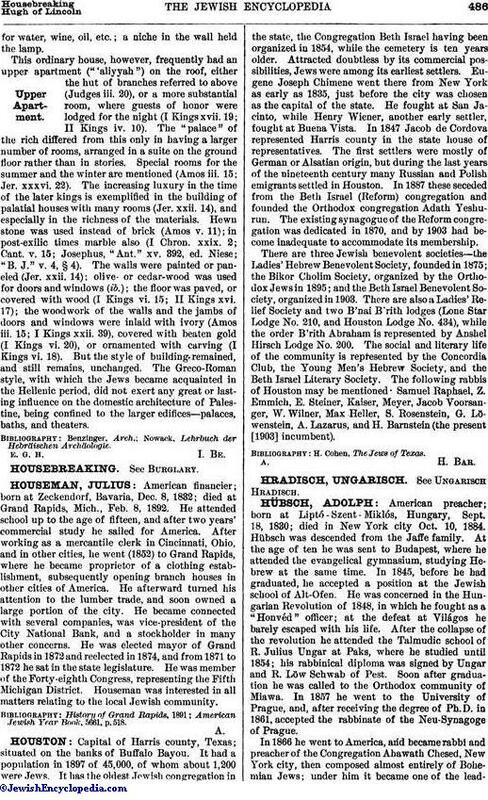 After the collapse of the revolution he attended the Talmudic school of R. Julius Ungar at Paks, where he studied until 1854; his rabbinical diploma was signed by Ungar and R. Löw Schwab of Pest. Soon after graduation he was called to the Orthodox community of Miawa. In 1857 he went to the University of Prague, and, after receiving the degree of Ph.D. in 1861, accepted the rabbinate of the Neu-Synagoge of Prague. 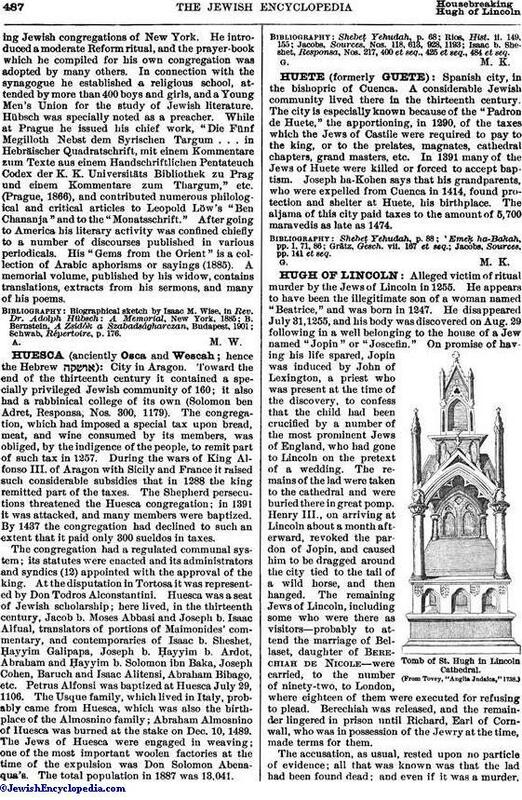 In 1866 he went to America, and became rabbi and preacher of the Congregation Ahawath Chesed, New York city, then composed almost entirely of Bohemian Jews; under him it became one of the leadingJewish congregations of New York. He introduced a moderate Reform ritual, and the prayer-book which he compiled for his own congregation was adopted by many others. In connection with the synagogue he established a religious school, attended by more than 400 boys and girls, and a Young Men's Union for the study of Jewish literature. Hübsch was specially noted as a preacher. While at Prague he issued his chief work, "Die Fünf Megilloth Nebst dem Syrischen Targum . . . in Hebräischer Quadratschrift, mit einem Kommentare zum Texte aus einem Handschriftlichen Pentateuch Codex der K. K. Universitäts Bibliothek zu Prag und einem Kommentare zum Thargum," etc. (Prague, 1866), and contributed numerous philological and critical articles to Leopold Löw's "Ben Chananja" and to the "Monatsschrift." After going to America his literary activity was confined chiefly to a number of discourses published in various periodicals. His "Gems from the Orient" is a collection of Arabic aphorisms or sayings (1885). A memorial volume, published by his widow, contains translations, extracts from his sermons, and many of his poems.